The Smoky Mountains area offers so much for a fun family reunion. Surrounded by majestic mountains, cool mountain rivers, wildlife, and many things to do for family members, this area can provide everything you need for your family reunion. Gatlinburg, Pigeon Forge, Sevierville, and Townsend all offer excellence in accommodations. 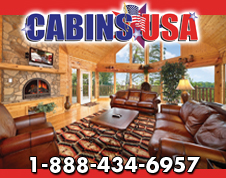 Whether you choose big cabins for groups or a hotel with pool and meeting rooms, your accommodations will serve your needs. Many attractions, including Dollywood theme park, Dollywood's Splash Country, Ripley's Aquarium of the Smokies, Tuckaleechee Caverns, and lots of other fun attractions provide days of fun for all age groups. Pigeon Forge and Sevierville are shopping havens, and you will find lots of unique shops in downtown Gatlinburg and in the arts and crafts community. Our restaurants range from mom and pop restaurants to fast-food, buffets, great breakfast houses, and fine dining. Many restaurants offer private dining rooms. Also available are overnight rentals that offer catering services, restaurants that offer catering, as well as private caterers. Event planners offer services for weddings and special events for family reunions. 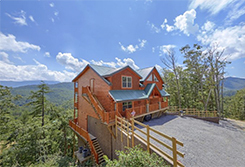 BRAND NEW and perfect for a family reunion in the Smokies! "Elk Ridge Lodge" is a luxury 5 bedroom cabin that comes with everything you need to enjoy your Pigeon Forge vacation to the fullest! 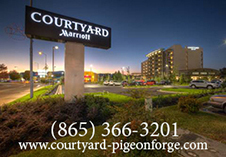 You are only 2 miles away from the heart of Downtown Pigeon Forge.